It rained in the morning for the 4th consecutive day. All of May! And it was foggy for the third morning. Today the rain was over by 6:30 but the fog lasted until noon. Then it got hot. 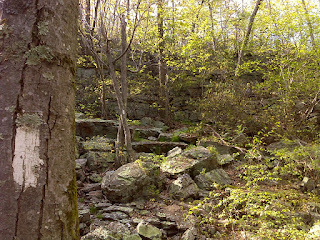 Today's bit of trail - about ten miles between Millbrook-Blairstown Road and about a mile south of Brink Road Shelter followed the ridge with lots of little ups and downs and some semi-Rocksylvaina-style rocky trail. There was even an unexpected scramble up this cliff beside Crater Lake. I needed to use my hands. 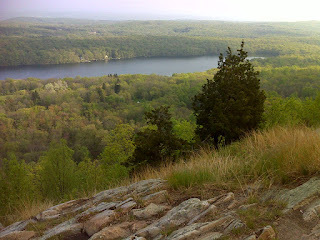 The best views of the day were those with lakes, now seemingly abundant along the trail (ever since we crossed Wolf Rocks, PA and entered the landscape that was carved by glaciers. Here's Fairview Lake from a heavily used viewpoint near Blue Mountain Lakes Road. A note about Blue Mountain Lakes Road. They have newly gated it off all the way down where it ends at Millbrook-Flatbrookville Road. I hear that there was some damage last year from Hurricane Irene, but the real reason for the closing is because of the sorry condition that govt. budget cuts have left Delaware Water Gap NRA in. The M-F Road is riddled with unrepaired potholes. 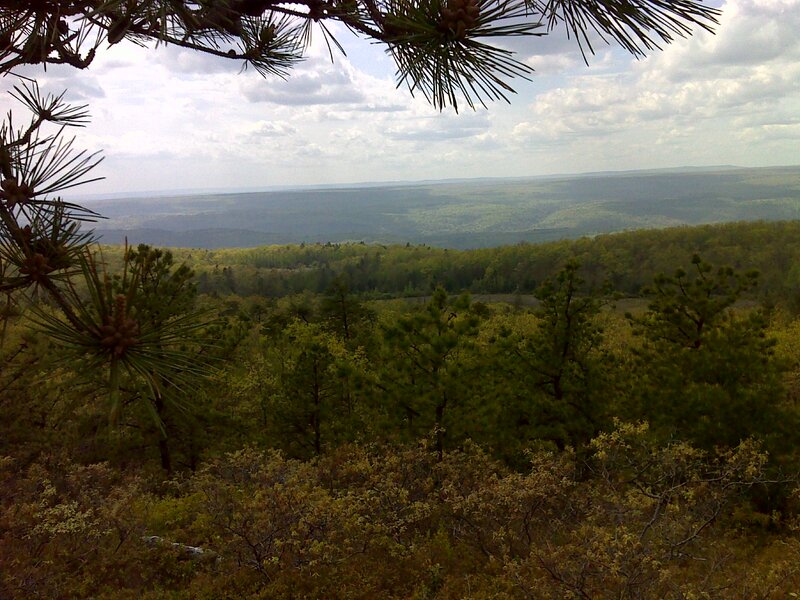 This Recreation Area is huge and isolated between the mountain and the Delaware River, and nobody lives on that side of the mountain. It feels as remote and isolated as any place I passed through in Southwest Virginia, but it has a different feel - neglected, unloved. On the trail I met two section hikers, one going north, whom I've passed multiple times in recent days. Today we finally had a good chat. He's 'Sun Dog' from MN, and is hiking Duncannon to Katahdin after doing Springer to Duncannon last year and getting sick. The other is 'Kit Kat'. 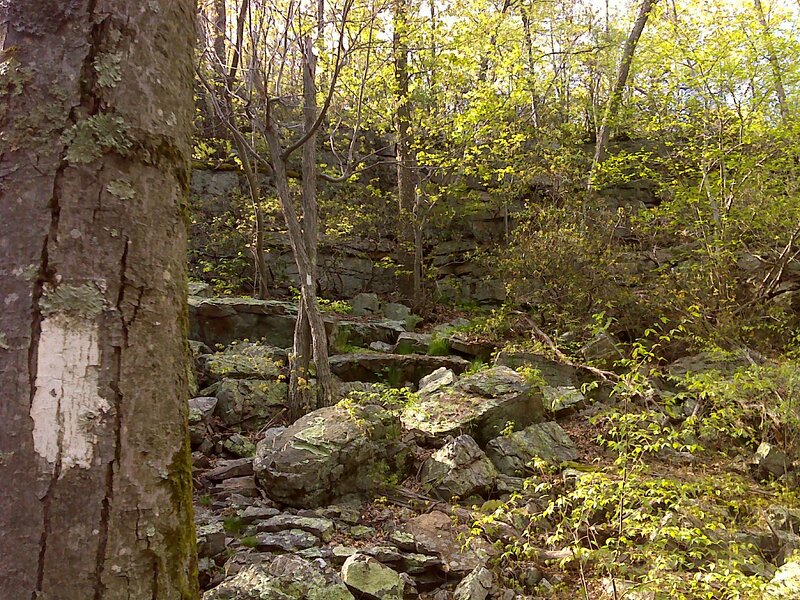 She's hiking south from MA to Daleville, VA and hopes to complete the trail with further section hikes before the end of the year. 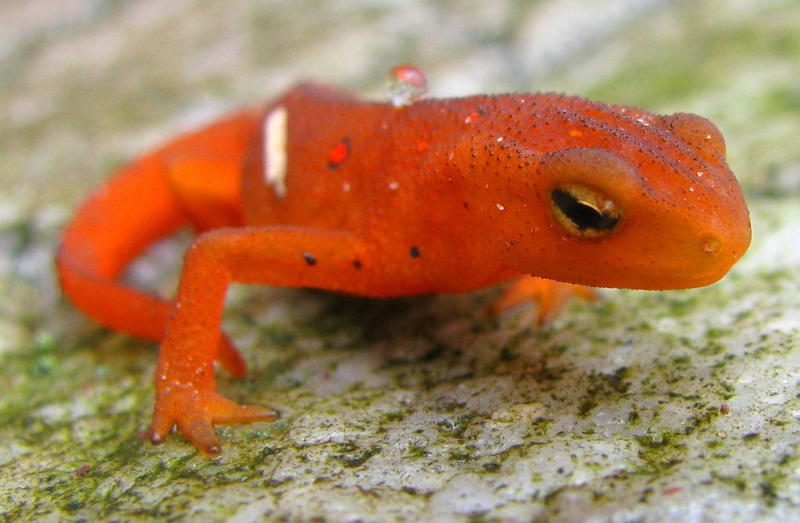 He's the juvenile stage of the ubiquitous Eastern (spotted) Newt. I've seen dozens of these little guys over the past few damp days. But today I finally got a good 'mug shot'. As I said up front, at about noon the weather broke after three foggy days in a row. It got hot and humid - but also allowed for the nice views shown above. I'm unusual among hikers in that I do not mind the heat and I actually prefer humid weather to dry. I like to sweat and do it well (*grin*). Probably the same high ratio of skin surface to body weight that makes me susceptible to feeling cold also allows me to keep cool efficiently by sweating. In any case, I enjoyed the afternoon, and especially the early evening hiking when the cool returned but the humidity lingered on. All in all a very enjoyable 20 mile day, my 114th day hike of this adventure. Onward to Maine!